How to get there: From the traffic circle in Lom, drive 7.7 kilometer towards Otta (Hwy. 15). Pay attention, the side road is rather small. There is a sign saying Soleggen 6. Turn right (dirt road), then immediately more right going parallel to Hwy. 15 (but in the opposite direction). If coming from Otta, this (left turn) is about 5.5 kilometer after you pass a small, white church (on your left) in the small village of Garmo. About 150 meter after you turn onto this road there is a self serve toll payment station on your left. Pay toll (NOK 40 in 2008), then continue 5.6 kilometer uphill where you locate a road fork just before Soleggen (you will see the large Soleggen building up ahead). Take the left fork about 150 meter across a small bridge and locate parking on your right. This is the trailhead, location N61:49.427, E008:37.662, elevation about 948 meter. Later in the summer, it may be possible to drive further aong this road, possibly to the place called Sålell. This will make the climb considerably shorter. 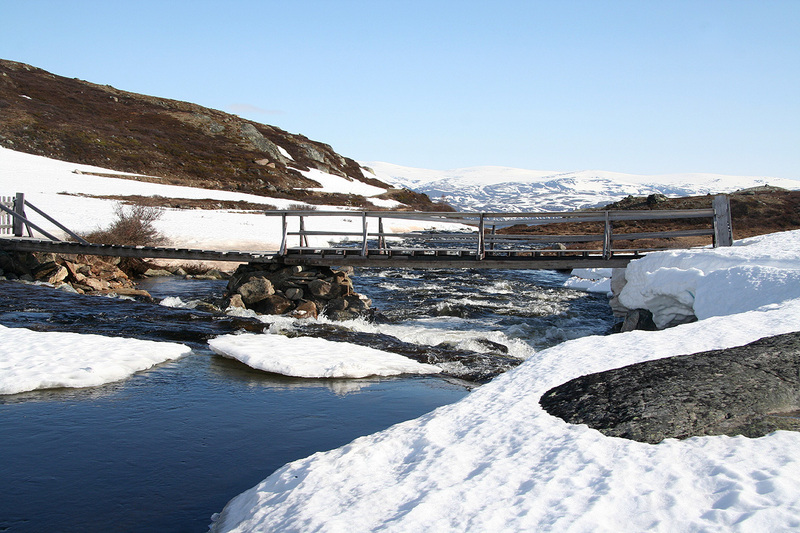 Route description: Follow the road to Skarddalen where there are many cabins. Just as you enter this wider valley, there is a bridge across the river on your left. Cross on this bridge, then continue more or less at the same elevation about one kilometer south. You should now easily locate a creek (small river) that drains the valley (named Kvitingsgjelet) coming down on your left hand side (east side). Ski the slope on the south side of this valley. 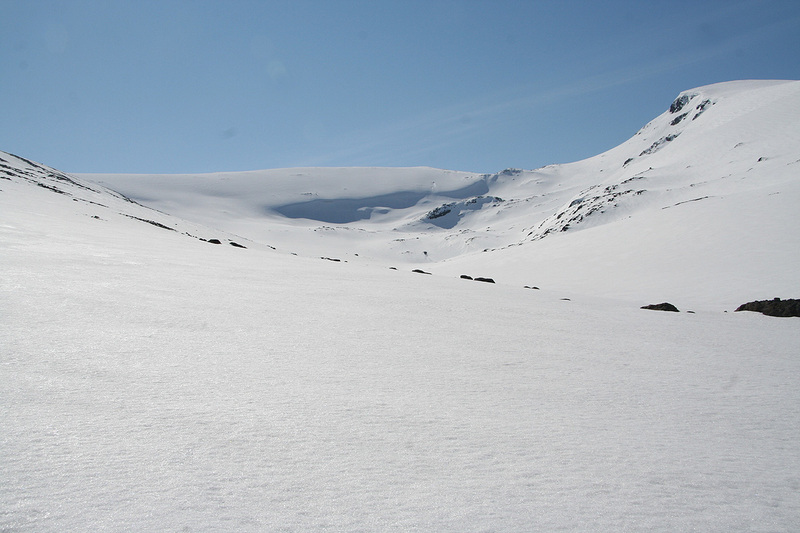 As you approach 1500 meter of elevation, you may either continue up this ridge to the West Kvitingskjølen summit or slowly traverse the valley and gain the east side of the valley. 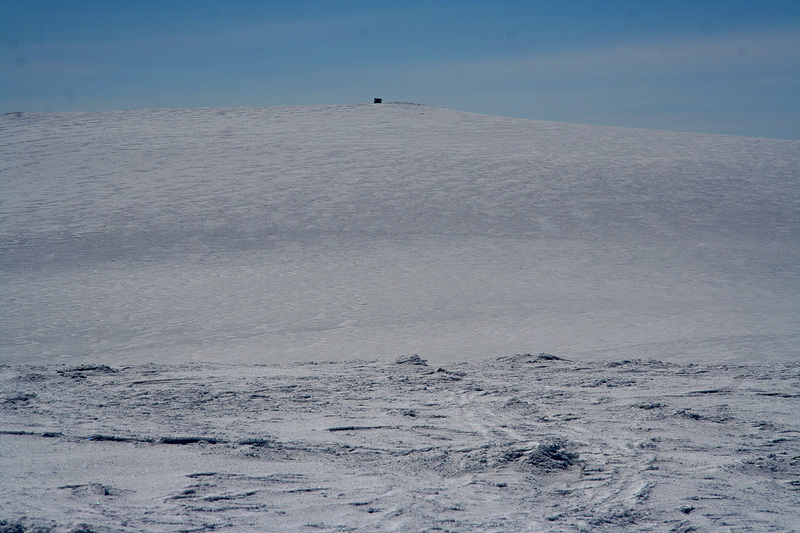 Climbing this slope will get you to point 2025, and from there quite easily onwards to the main summit at 2064 meter. 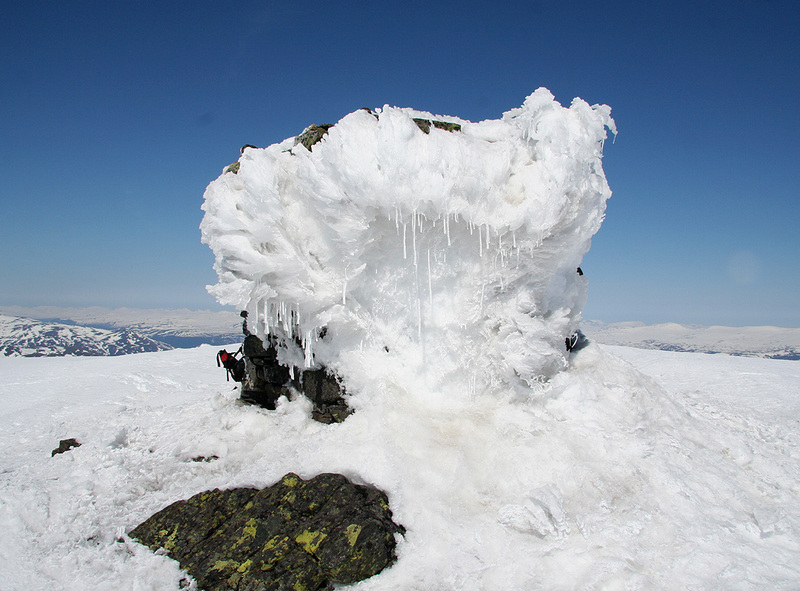 This summit has a very impressive cairn. Comments: I stayed at Fossheim hotel in Lom and had an excellent dinner the night before. This hotel has nice rooms and a very good kitchen. If they could fix their wireless LAN service (which is complementary), then this hotel would score quite high on my personal preference list. I had an early, but still very good breakfast, then set off. As I had explored the trailhead the day before, everything went very smoothly indeed. I left my car at 0815 and hiked along the road on foot until location N61:48.559, E008:37.371, elevation 1100 meter. From here, I could ski the rest of the way to the summit. I took the main break slightly above 1600 meter in the upper basin below the Kvitingskjølen summits. The weather was near perfect, no wind, blue sky and a nice temperature. I continued more or less straight uphill and located the minor point 2025 on my way to the main summit at 2064 meter. I had arrived at precisely 1200 - noon, thus deserving a good rest. Nobody around in these mountains today. A few old traces of ski tracks, nothing more. A very impressive cairn that must have taken a lot of work to build. 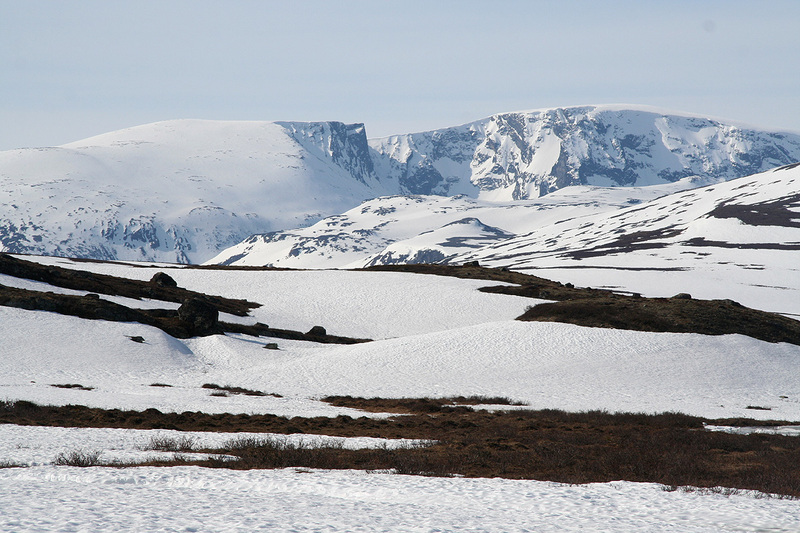 A good view to Jotunheimen from a new viewpoint. I took a sequence of pictures for making a 360 degree composite panorama, then headed towards the west summit, only 4 meter lower. The trailhead area as seen from higher up. A bridge near Sålell, I crossed here. The view ahead near Sålell, Kvitingskjølen is out of view sharply to the left. 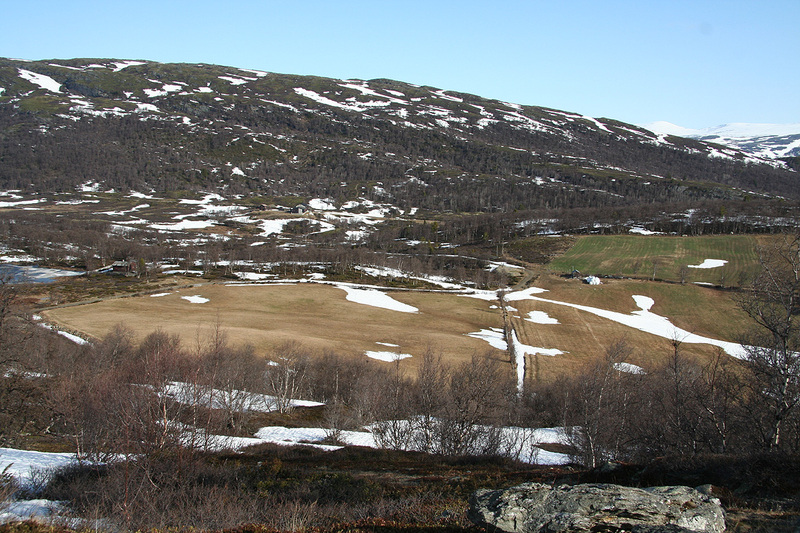 The very upper part of the valley Kvitinsgjelet.